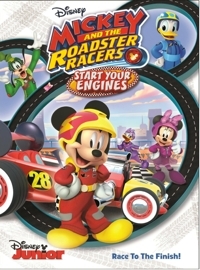 Mickey and the Roadster Racers: Start Your Engines includes seven episodes from the CGI-animated Disney Junior TV series that replaced Mickey Mouse Clubhouse in January 2017. Parents who watch this new show with their toddlers will probably lament that it seems less educational than Clubhouse—at least on the surface. 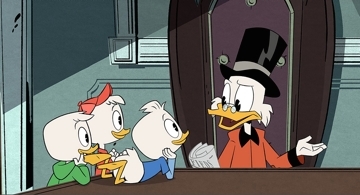 Yes, there are all sorts of primary colors and simple syntaxes that tiny ones can pick up, but the show panders to children’s shrinking attention spans by featuring two 11-minute episodes every half-hour series instead of one 22-minute story that tried for more interactivity. 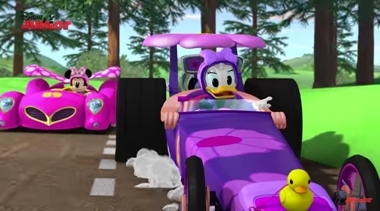 Every half-hour show features one “Roadsters” cartoon featuring a race, mostly, and one “Happy Helpers” cartoon, where Minnie Mouse, Daisy Duck, and Cuckoo-Loca (a new character) do various things to help the residents of Hot Dog Hills. 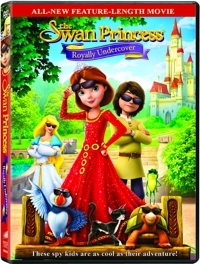 Given the widespread popularity of the Barbie animated features, odds are that parents may be thinking The Swan Princess: Royally Undercover is a knock-off of Barbie of Swan Lake (2003). If anything, it’s the other way around. Former Disney animator Richard Rich (The Fox and the Hound, The Black Cauldron) made his first adaptation of the Tchaikovsky ballet way back in 1994 with The Swan Princess, starring Michelle Nicastro as the Princess Odette, Howard McGillin as Prince Derek, and Jack Palance as the evil Lord Rothbart. 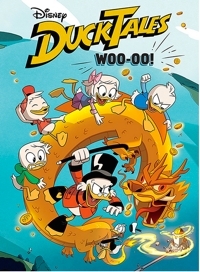 That debut turned into a mostly direct-to-DVD franchise for Nest Family Entertainment, which quickly followed with The Swan Princess: Escape from Castle Mountain (1997) and The Swan Princess: The Mystery of the Enchanted Kingdom (1998). 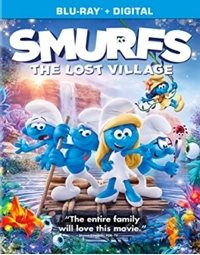 Then, after a 14-year hiatus, they came back with The Swan Princess Christmas (2012), The Swan Princess: A Royal Family Tale (2014), and The Swan Princess: Princess Tomorrow, Pirate Today (2016). All of the Swan Princess sequels tend to fall in the same made-for-young girls ages 2 through 8 range. 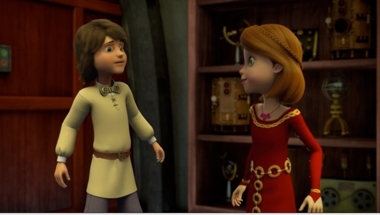 The Swan Princess: Royally Undercover is no exception. But it is exceptional by comparison. 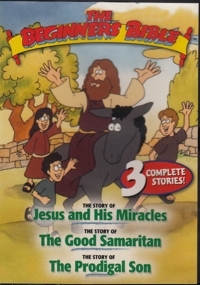 Like the other installments in this series, these animated Bible stories are really well adapted, with writing and dialogue that aim to be both contemporary and accessible for the target age group combined with animation that takes a page from Saturday morning cartoons. Any menace is softened and any didacticism is made more interesting with bright colors, rounded forms, and big eyes. 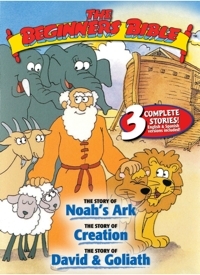 Disobedient sheep smile, uh, sheepishly, and the whale looks cute as a bathtub toy—even smiling with big bright eyes as he descends to the deep with Jonah inside his belly. With a face like that, how can you expect a harsh end to poor Jonah—especially when Jonah voluntarily jumps overboard when the storm hits his ship and the crew thinks he’s brought them bad luck, rather than the men tossing him over the sides. In other words, anything that might seem harsh is somehow softened. 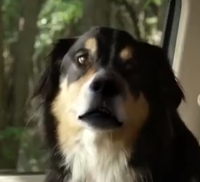 The bright and cheery music helps, too. 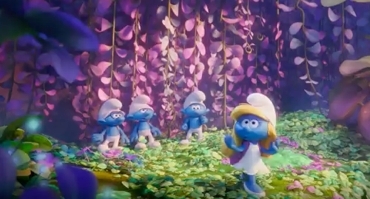 The writers and filmmakers take such liberties as they add humanizing details to make the characters seem more interesting for youngsters, or to better explain and contextualize the stories. Joshua tells the king he defeats at Jericho, “When I told you God would give us this land, you called me a fool. Who’s the fool now?” There’s a little bit of “Nyah-nyah” in there that kids can identify with. 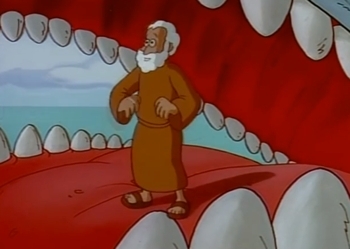 The characters’ reluctance to obey God in the first place is often given more interpretive context: “I can’t do something to help my enemies,” Jonah says when God tells him to go preach to the Ninevites. 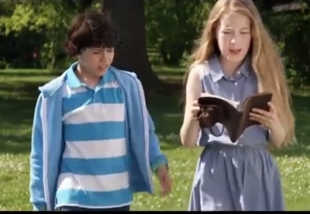 “How can I preach to the enemies of the Israelites?” Some parents/purists might object, but making such connections more obvious and adding humanizing elements really does make the stories more palatable for the target age group. 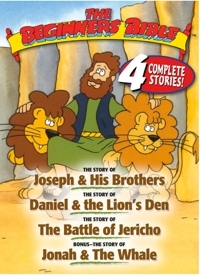 Like the other volumes in this series, The Beginners Bible: Volume 4 is a winner because the filmmakers really adapt the stories well for young contemporary viewers: removing the violence and softening the harsh elements, changing the vernacular to be more contemporary, adding humanizing and fun animated details, and helping children to not just understand the stories but to understand the characters’ emotional responses. Yes, they take liberties, but ultimately their decisions pay off. 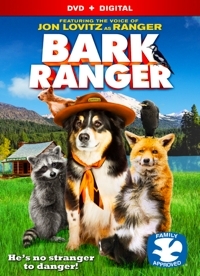 They really hit the mark for their target audience.